Looking for the ultimate crystal clear aquarium? The biUbe Pure is a complete aquarium system and the latest addition to the biUbe range. This very cool and hi-tech aquarium provides an ideal home for a variety of fish, and will also serve as a stunning centerpiece for any room. Reef One creates technologies and aquariums that offer some of the most advanced features and always at an affordable price. In addition to being a focal point in any room, the biUbe Pure is also low-maintenance, meaning you won’t have to spend hours looking after it. 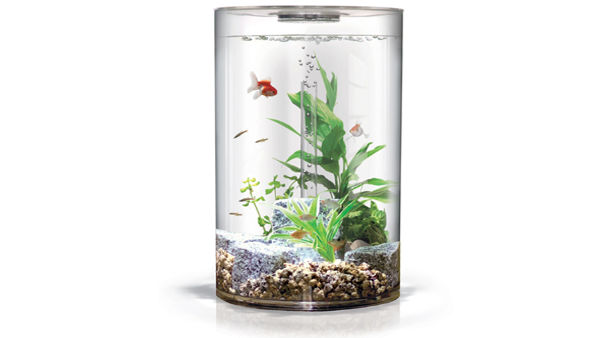 The biUbe Pure uses the same advanced filtration of the awarding-winning biOrb aquariums coupled with a new look that is perfect for any modern space. We love the look of this tank, and feel that it’s unique design makes it worth looking into. Naturally, there are limitations to what can be housed in the biUbe Pure, but the stunning visuals may be worth it.